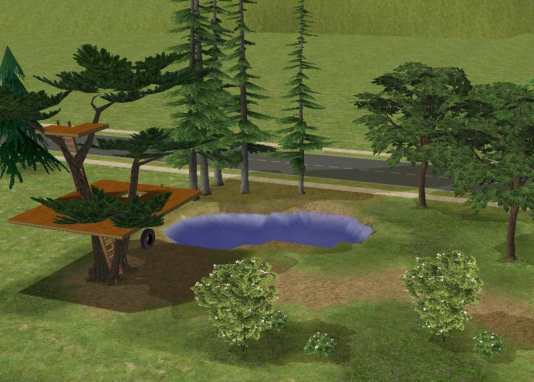 Mod The Sims - -Old Tire Swing- Swing for BaseGame, and a (BV) Treehouse! After a very long and frustrating journey, I have arrived at the Challenge Uploads page. With me I bring my project, a Tire Swing, completely BaseGame compatible and it WON"T overwrite the Maxis swing. If you are thinking, well good, new objects aren't supposed to anyways... what's your point? Then you have NO IDEA why there aren't more CC swings out there. The BaseGame Maxis swingset was deemed 'not clonable' because of badly coded GUID referencing BHAVs. It required a lot of patience and the talents of our wonderful Echo to discover. This project would not have been possible without her and Stormwench. The two were constantly offering to look at my project to see what was going wonky with it this week. After I finally had one that didn't have coding errors, she and Echo helped me fix the mesh/texture problems. THANK YOU BOTH SO MUCH! Now, everything isn't peaches, strawberries, and roses. Animation. A sim's fingers are still going to be in a grasping fist position. 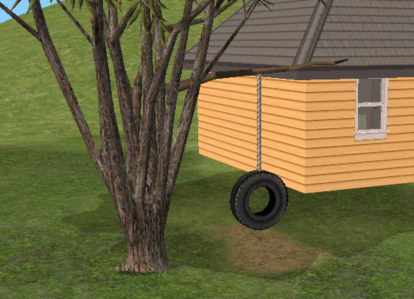 To enter and exit the swing a sim will just float through the top part of the tire. During the backwards half of the swing arc a sim's head and shoulders dip into the tire. Small children can get lost in the tire as well. I really can't help any of these, I am at the mercy of the Maxis swing animation. Small fixes could be made on the mesh itself, but I've already tried doing that as much as possible with still keeping it looking like a tire swing and keeping it the same size as the tires on a car. None of my pictures show these issues, so I'm sure all the great storytellers can avoid having them in their shots as well. (Movie makers are going to have a trickier time covering it). All that aside, I still love the way it turned out, and I plan on using it far more than I've ever used the Maxis swing (footprint was too big in my opinion, this one is 1x6 instead of 2x6). I hope you enjoy it too. As a final parting gift I have included a community lot (requires all EPs) for you to use in your newly created rural communities that this contest has sprouted. 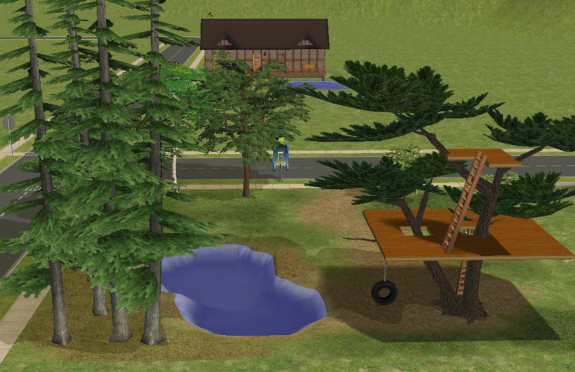 The community lot has a tree house, my tire swing, and a pond and trees. To correctly view and play the lot you need to download my Tire Swing and Marvine's Animated Ladders. There is no other CC in the lot at all. My First Time: Making an object with such complicated BHAV editing! Intermediate SimPE skills, beginning object creation, object recoloring, object meshing. Nitty-gritty: Please don’t upload any of my creations anywhere, they are my toys to share, but I want to be the one to share them. If you use my swing in a lot you upload, please link back to me instead of including it. Thanks for respecting my work! You can, however, recolor it and upload those recolors here at MTS2 without asking for my permission. There are a bunch of trees with different shades of bark out there and I KNOW I made sucky branches. I would find it a compliment if you recolored it! To Echo and Stormwench and JasanaBugbreeder and Tiggerypum and Wndy26 and everyone else who has helped me during my late night chat room sessions on this project. THANK YOU ALL! Kalimos and I had fun playing on the swing, we felt like little kids, or at least young lovers again!